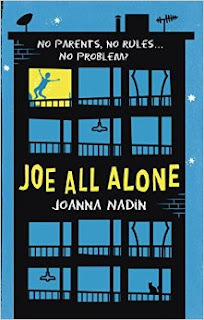 When his mistreated Mum and her bullying, layabout boyfriend Dean go to Spain for the week, 13 year old Joe Holt is left home alone in their dilapidated old flat in Peckham. With £10 for the electric meter and plenty of pasta and beans in the cupboard, Joe has big plans for his week- chocolate for breakfast, as much telly as he wants and unlimited XBox. The anxiety in his stomach, the treading on eggshells tension, the waiting to do something wrong and waiting for the shouting and smashing vanishes, and for the first time in months Joe starts to relax. Until the day of his mum's return comes. And then goes. With no sign of her or of Dean. With the money running out, electricity off, cupboards empty, bullies pummelling his face in and some serious-looking gangsters hammering at the door until 2 in the morning, Joe knows his luck in running out. He's going to have to find a more long-term solution for his problem. With his stained and stinking uniform, his greasy hair and unwashed face, it's not going to be long before one of the teachers gets involved- Joe's been told about the ones that pretend to be on your side and then get you landed in care. There are some excellent characters in this book; kind-hearted Otis, a real gentleman and good Samaritan who was unceasingly lovely, despite Dean's low (and totally unreasonable) opinion of him, the rebellious and fast-talking Asha, and Joe, who I was really rooting for. I hated how grim his life was- the name calling at home and school, the teasing for this anxiety counting and specific interests. I hated that he believed people when they told him he was good for nothing. The book manages to combine realism and hope really effectively. It feels gritty enough for a MG book, Joe describes his life, Dean's family, his depressing flat with the no pictures on the walls and the stained, dirty furniture. There's the suggestion of domestic abuse, drugs and alcoholism, but it's not over-worked. Joe knows it happens, but he's pretty vague about the details. Same with his Mother's obvious psychological abuse at he hands of Dean- Joe just tries to stay out of it- resigned to the idea that his mum has chosen Dean and this is just how his life is now...the same can be said for Joe's OCD and obsessive traits. They rear their head from time to time, but it doesn't become 'his thing'. Generally, it's pretty clear that Joe is an ordinary kid that comes from a very impoverished, unstable background and has no real outlet for his fears or feelings. I'm glad he found Asha. Joe All Alone is a really quick, uplifting read that deals with neglect and poverty in a gritty but realistic way. The ending is far from fairytale, and much more mundane real-life than the adventure that it starts off as. It's filled with some memorable and relatable characters, and no magic solutions for all of life's problems. It reminds us that families are complicated, people do stupid things, that thuggish, small time crooks will always take advantage of the weak and that it's important to forgive, but sometimes the thing that you want isn't necessarily the best solution.